on the South Coast. 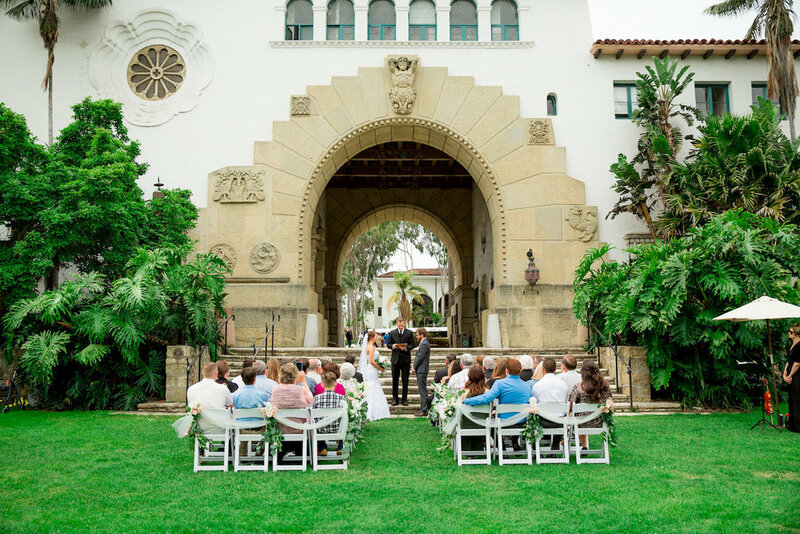 Perhaps the city's most recognizable landmark, this circa-1929 structure illustrates the beauty of Spanish Revival architecture and provides a sense of magical nostalgia that is Old California. This building still functions as a working courthouse and welcomes visitors to view it's impressive details. Among them are murals, tile work, beamed ceilings, decorative painting, ornate woodwork, and wrought iron fixtures. Other notable features include manicured, sunken gardens and a clock tower that affords amazing views of the city, ocean and mountains. All this provides stunning backdrops for wedding photography. This completely unique venue is suitable for both small and large weddings up to 200 guests. 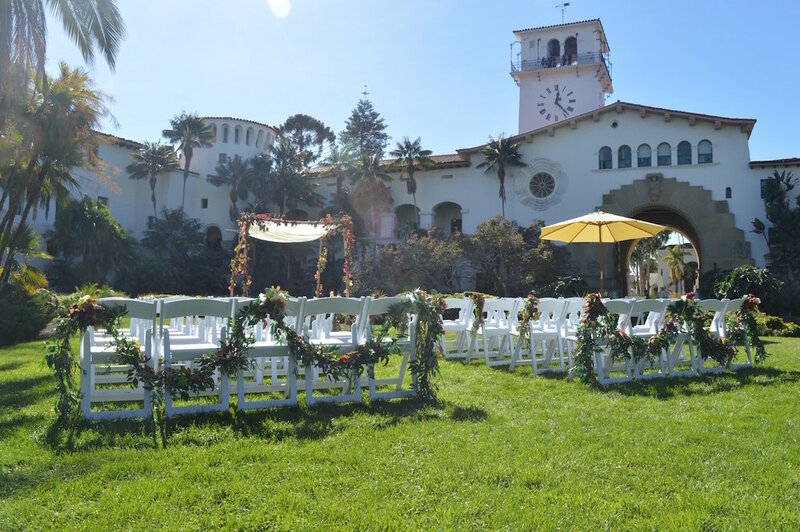 There are several ceremony sites within the Sunken Gardens to choose from. See our recent story about the beautiful onsite locations. Professional Photographer - Captures your special moments, up to 1 1/2 hours, edited photos for you to share with family and friends. Delivered via a digital transfer. Wedding Coordinator - 2 hours on day of wedding. Works closely with you and your guests to ensure to that your ceremony receives personal attention, is memorable and flows flawlessly. Provides wedding ceremony timeline, supervises set up, decor install, breakdown of ceremony site. Site Crew - Delivers, sets up/breakdown chairs, assists with decor install, supervises foot traffic during ceremony, assures cleanliness of site. Preferred Vendor List - Our best recommendations for dining, cakes, accommodations, beauty services, activities, and more. Advice on obtaining a marriage license. Bridal Bouquet and matching Boutonniere - Exquisite floral designs using the freshest seasonal flowers from local growers. Please note that site fees are not included in our package pricing and are booked through Santa Barbara County.